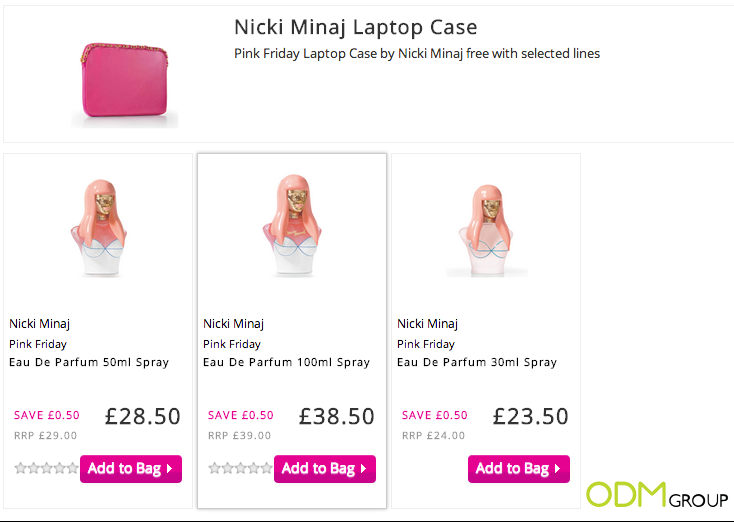 Receive a free Pink Friday laptop case when you purchase selected fragrances from Nicki Minaj’s fragrance line! The laptop case is aimed at the teenage market and thus, has been designed in a bright shade of pink with gold embellishments. This offer is on valid for a limited period of time; so do check it out at The Fragrance Shop now! Why offer laptop cases as a gift with purchase? Laptop cases are not the typical promotional products that companies give out; therefore it is considered an exclusive gift. Unique gifts help your brand to stand out from the rest of the competitors and will enable you to gain the respect of your customers. Customers always respect brands that are creative and unconventional. This increased in customer loyalty and support will benefit your company in the long run! Furthermore, laptop cases are items that are perceived to have high utility value. Thus, this increases customer satisfaction as customers feel like they are getting more value for their buck! It is also very practical as your customers will be able to use it to bring their laptops around. How can offering a laptop case benefit your company? By offering an attractive marketing gift like the laptop case, many people may purchase the product in order to obtain the free gift. This will help to boost your sales and increase your profits! It was also help to increase brand awareness as people might stop to take a look at the laptop case and discover the Nicki Minaj brand. Interested to offer your very own customized laptop case in your upcoming promotion? Well, feel free to contact the ODM team for any assistance you require!